Many people dream of climbing Kilimanjaro. And there are several routes to take you to the top of the mountain, Uhuru Peak. But which is the right route for you? 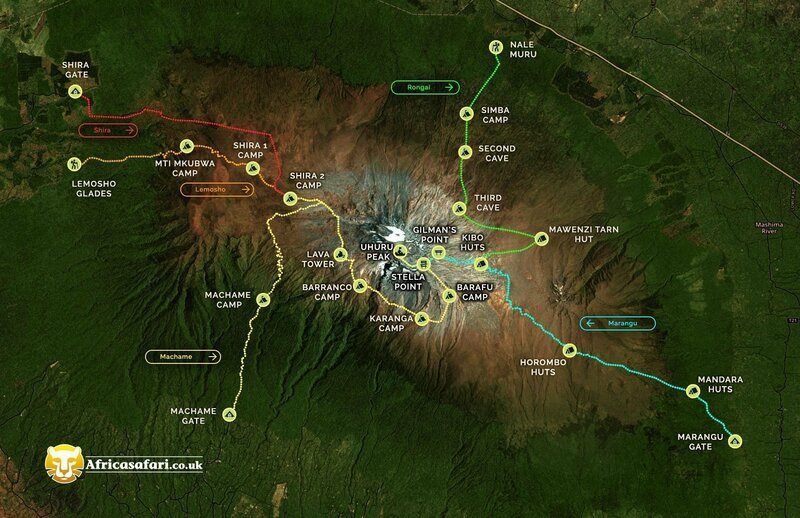 There are seven different routes on Kilimanjaro. 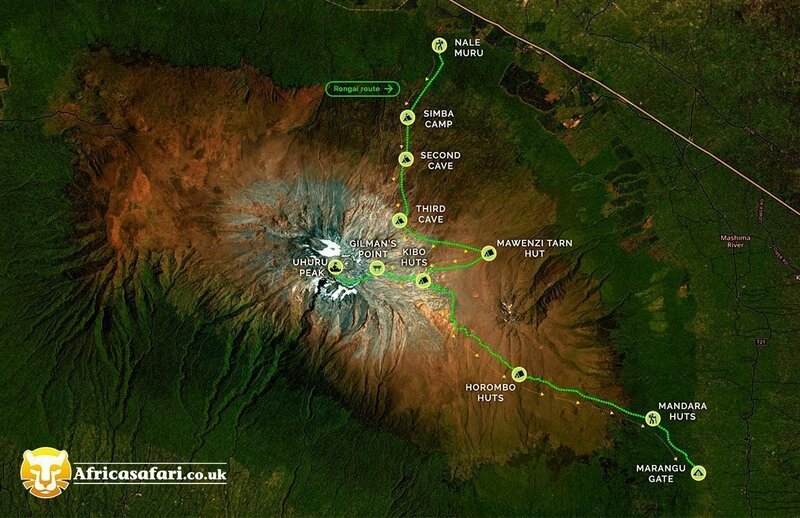 You can currently choose from five of the routes at Africasafari.co.uk: Machame, Marangu, Rongai, Shira and Lemosho. In addition to these are the Northern Circuit and Umbwe routes. Each route has its advantages and disadvantages. You should therefore choose the route that suits you best. What’s more, several of the routes merge on the last part of the ascension, and the vegetation you see along the way varies. 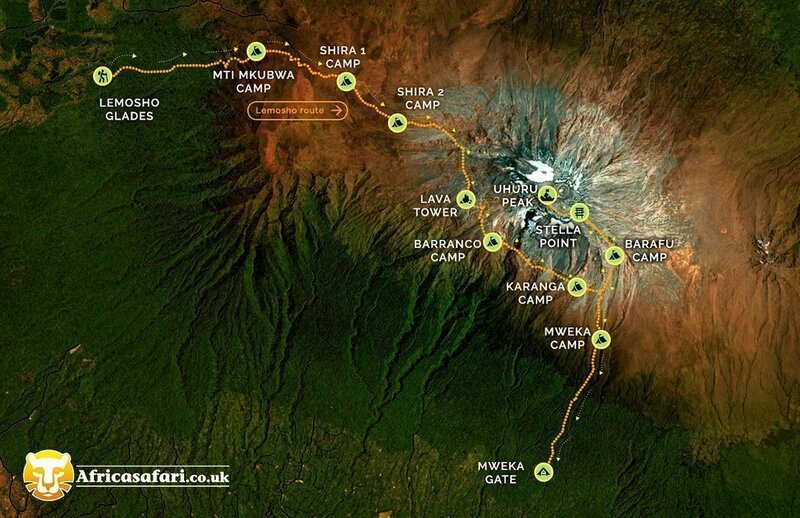 Several of the routes merge with each other on the last part of the trek to Uhuru Peak, Kilimanjaro’s highest point. The routes we take pass via Barafu Camp and Stella Point (Machame, Lemosho and Shira) or via Kibo Huts and Gilman’s Point (Marangu and Rongai). Depending on the route you choose, you pass through natural agricultural landscapes, forest, rainforest, heathland, alpine desert and, of course, the ice landscape at the top of the mountain. Read more below about the five routes we offer. Please note that the camps and exact routes may vary slightly from operator to operator. The Machame route is an incredibly scenic route and a popular choice for a lot of visitors. 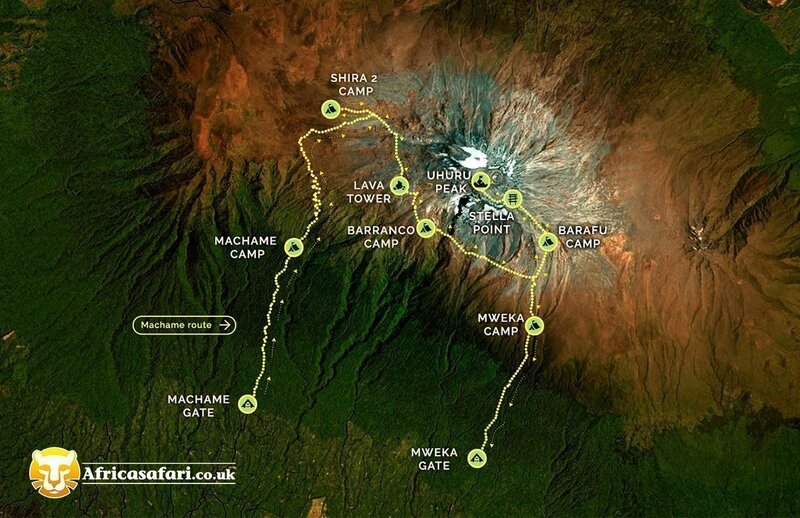 The route sets out from the south-western side of Kilimanjaro at Machame Gate, descending via the Mweka route. According to some, the Machame route is the most scenic of all the routes, which has also added to its popularity. Machame is less technically difficult than tough. At times, the route crosses fairly steep terrain where you have to trek up and down, requiring a great deal of stamina. The Machame route is therefore best suited to those looking for a more challenging trek. The hardness of the route has also earned it the nickname, the Whisky route. The popularity of Machame makes it a busy route compared to Rongai, Lemosho and Shira. So if you’d like a less peopled route, you should choose one of them. Machame has a relatively high success rate due to its good acclimatisation options along the way as you “climb high and sleep low”. The Machame route takes six days. Why should you choose the Machame route? The Marangu route is one of the oldest and most popular routes on Kilimanjaro. The route starts on the south-eastern side of Kilimanjaro at Marangu Gate. Marangu has been nicknamed the Coca Cola route because it is possible to buy drinks and snacks in the cabins en route to the top. The name is a striking contrast to the somewhat harder Machame route, nicknamed the Whisky route. Unlike all the other routes, you sleep on simple mattresses in primitive cabins rather than in tents. This may be an advantage if you prefer a little more comfort or if you are trekking during the rainy season. Marangu is a beautiful route, but less varied than the other routes as the ascent and descent take place via the same route. So, you see only one side of the mountain. The Marangu route is popular, which means that it is busy in certain periods. The popularity may be due to the fact that the route is less challenging than other routes. The Marangu route is the most direct route to the top and a gradual and steady ascent. However, the mistaken assumption that the route is “easy” causes many people to suffer from altitude sickness because they come unprepared. 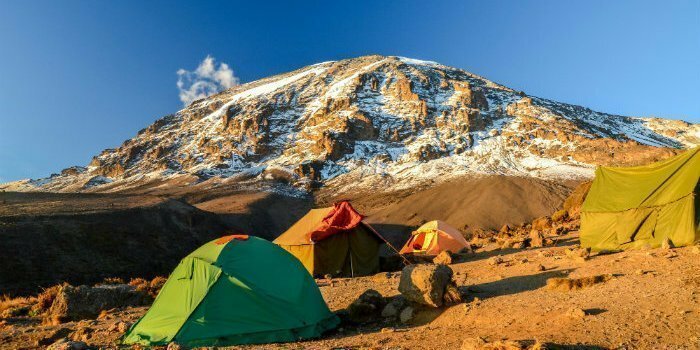 On Marangu, you are not generally able to “climb high, sleep low”, which means that it is harder to acclimatise, and the success rate on the route is therefore lower. The recommended minimum length is five days, making it the shortest route to Kilimanjaro. Due the route’s poor acclimatisation profile, we have incorporated an acclimatisation day to increase your chances of reaching the top. So, the trek with Africasafari.co.uk takes a total of six days. 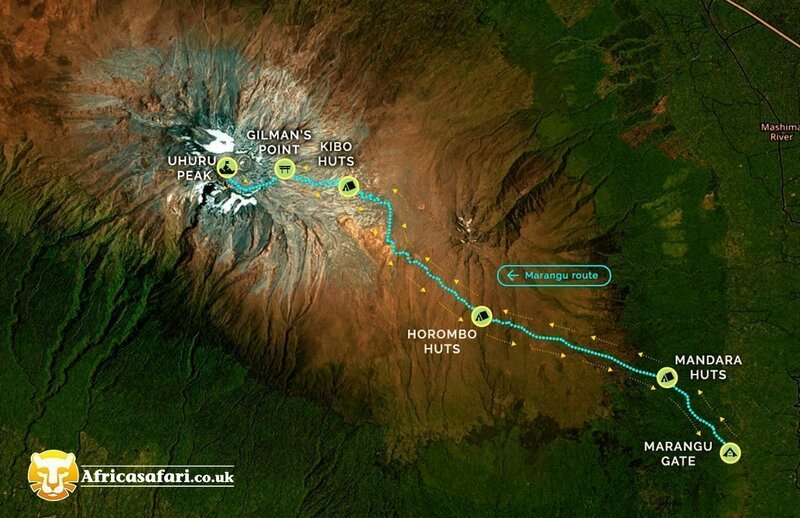 Why should you choose the Marangu route? 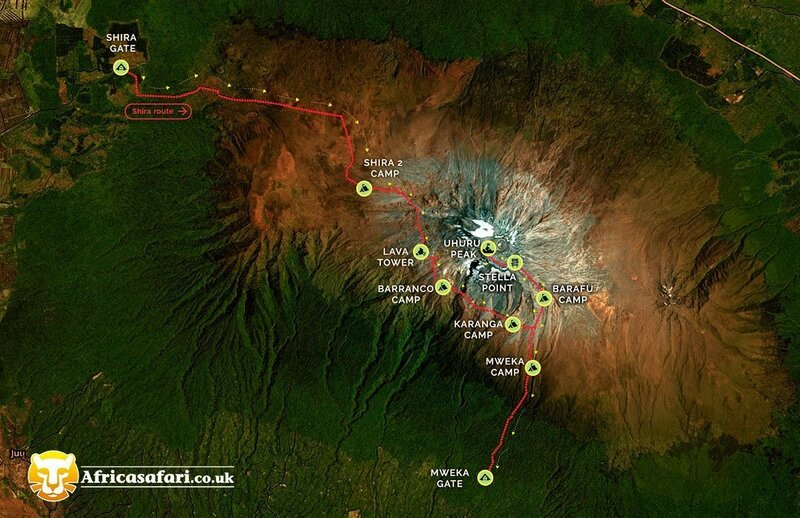 The Rongai route starts on the northern side of Kilimanjaro, close to the border with Kenya. It is the only route that sets out from the north. Its northerly position means that the route is sheltered from rain, making Rongai an ideal choice during the rainy season. However, the lower rainfall means that some people find the route less scenic, and you don’t experience the rainforest on the ascent as you do on the other routes. On the other hand, you have a far better view of Kilimanjaro from the north than from the south. And you get to experience the area around Mawenzi Peak, which is one of the most scenic areas on the whole mountain. Rongai is one of Kilimanjaro’s easier routes as, like Marangu, it is a slow, gradual climb without steep ascents. Rongai is also less busy and more remote than the more popular routes. And when Rongai eventually merges with Marangu at Kibo Huts, it may feel like more of a “private” trek to Kibo Huts. The recommended minimum length is six days. The route does not generally offer the chance to “climb high, sleep low”, so we have incorporated an acclimatisation day. As a result, the route takes a total of seven days to increase the success rate. Rongai is typically more expensive than Machame and Marangu due to the extra transport from Moshi to the north side of the mountain. Why should you choose the Rongai route? The Lemosho route is a very scenic, unspoiled and remote route compared to other routes. And many people believe this route to be the most beautiful of all the routes on Kilimanjaro. Lemosho is also one of the newest routes. It was originally made as an improved version of the Shira route, but differs in that it is longer and the first night is spent lower than Shira, making it more acclimatisation-friendly. As with the Shira and Rongai routes, you have to drive quite a way before reaching the starting point. This, along with the fact that Lemosho is a longer route, means that the route is the most expensive of the five routes. In return, you get a route with a good balance of beautiful scenery and limited traffic. The route starts west of Kilimanjaro at Lemosho Glades, and is a far less busy route than Machame and Marangu, for example. Lemosho is a relatively difficult route. On the other hand, the good acclimatisation options under way make for a high success rate. It is recommended that you spend a minimum of seven days on the Lemosho route. At Africsafari.co.uk the trek takes eight days. Why should you choose the Lemosho route? The Shira route is almost identical to its little sister, Lemosho. However, the Shira route only takes six days. Like Lemosho, the route sets out from the western side of Kilimanjaro. On Shira, however, you drive to the starting point, Shira Gate, and you can expect a tougher and more demanding start than all of the other routes. Your first night is, for example, spent at 3,840 AMSL. At this height, there is a risk of altitude sickness, making it extra important to listen to your body. The Shira route is a beautiful route with less traffic than on popular routes like Machame and Marangu. Those who choose Shira over Lemosho typically have less time and less money to spend on the tour. What’s more, you will need to have the courage and desire to tackle the hard start of the Shira route. Why should you choose the Shira route? *On our tours, Marangu and Rongai include an acclimatisation day, increasing both the success rate and acclimatisation. If you want to be sure of choosing the right route for you, we recommend that you contact our travel consultants. You can also take a look at our ultimate guide to Kilimanjaro, which will answer any questions you may have.